Don't Eat the Paste: So you want to grow raspberries? 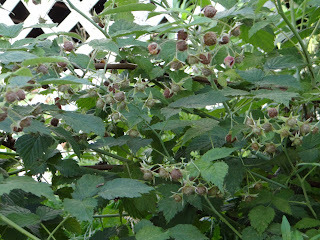 So in the last few weeks, I've been showing off my raspberries frequently on Facebook at all sorts of stages. This has inspired several people to decide they are planting them next year. In order to avoid a lot of people saying "It's all your fault!" to me in 3 years, here are some observations I've made growing raspberries. It's tempting to look at the canes, and look at the area you plan to plant them in, and decide "Oh, I need lots of plants to fill in that area." DON'T. Really. Trust me, once your canes are established, they will fill in the area. Figure 1 cane per 12-18 inches at least. Maybe less, and not more. Raspberries are very invasive. They like lots of room to spread, and don't take long to spread. This year, that patch maybe fairly barren with only 2-6 canes, but next year it will fill in some, and in 4 years, you'll be completely filled in. If you don't care about type- you can frequently get canes very low cost or even free. Post a note on Craigslist, a local supermarket bulletin board or a local gardening forum on FB that you are looking. I know that around spring I saw lots of ads on Craigslist offering raspberries to people if they were willing to come dig them up. My own berry thicket started as 3 canes bought at a local farmer's market for 1.00 each. Yeah, 3 whole dollars. They weren't pretty, they were pretty much sticks with a couple leaves stuck in a fast food cup with some dirt. If you have friends who grow raspberries, you can also ask them. I know that I'm willing to share! If you care about type and want more than one kind, you may have to pay a bit more. Here, golden raspberries are very popular and can cost 15-25 dollars even at farmer's markets, but friends who grow, or getting in contact with local gardeners can get you a better price. Did I mention that raspberries LIKE to spread? They really, really do. If you want specific strains, talk to local gardeners, and only if that doesn't work, go to a nursery either online or in person. Raspberries are sent much like roses. You'll get a root and a cane to plant. Find an area that gets a good amount of sun. Here in Alaska during the summer, pretty much every part of my yard gets at least 8 hours a day. They are in a place that gets 10 hours. Pick an area that drains well, they don't like to stand in water. Dig a hole a little deeper than the roots and about twice as wide as necessary, place in the plant, and fill in the dirt. Work in a little good organic fertilizer or better- compost. What you don't need? Fancy, expensive, specialty garden soils. If you live in an area raspberries grow, they are dead unpicky about soil types. They even like it a little acidic. If you're growing a couple kinds, keep them separated by as much distance as is feasible in your yard or they may cross. That's what my raspberries are, a cross between wild raspberries and a couple strains that the original grower had a little too close together. I love them, they are sweet and tart and really good producers. Raspberries don't need much care. I do give mine a bit of a good organic fertilizer or compost tea every so often. Usually just the little bit leftover from taking care of my more demanding plants. However, if it's dry, you will need to water regularly. This summer has been fairly dry, and on the hottest days, I water them once a day even though the rest of my plants get twice a day. Why less for the raspberries? Because my thicket is very well established, and very dense which provides lots of shade for the ground they are in. Water just doesn't dry out as quickly as it does in my beds and has time to really soak in. First year canes are a greenish color, after that, they turn brown which makes it very easy to tell which are the new canes. First year canes don't generally produce fruit, but second and third year canes do. After that, you'll want to prune them back to make room for the new canes that came in that year. This is what my mature canes look like. These will be pruned after they are harvested because there are lots of new canes coming in. They are nearly horizontal with fruit, and some of them need to be staked because they are literally bending so far they are touching the ground. Some are ripening now and taste fantastic. I mentioned that raspberries spread right? While the berries do have small seeds, that's not how they spread for the most part. They spread through the root system which can go deeper than expected and cause the raspberries to jump barriers. What a lot of people do, once they have them established, is just mow the new canes down when they mow the lawn when they get outside their area. What you don't want to do is try to plant anything near them. I had a rhubarb that was a couple feet away from these 2 years ago, and this year it didn't come back at all even after I dug up the crown and replanted it. The raspberry roots killed it. My original plan was a 4x3 foot area for raspberries, now I've decided to let my raspberries grow outside that, and they take a space that's about 15 square feet now, I moved some of the new canes down that wall and plan to let them grow to fit a space about 8x4 feet. But this is where I don't want people yelling it's all my fault in 3 years. They WILL spread. If they are in the kind of soil they like, getting enough water and sunlight, they will spread like crazy and can destroy anything else you have planted in that area. I have seen cases where they didn't spread, but in my non-expert opinion, that was a soil issue. 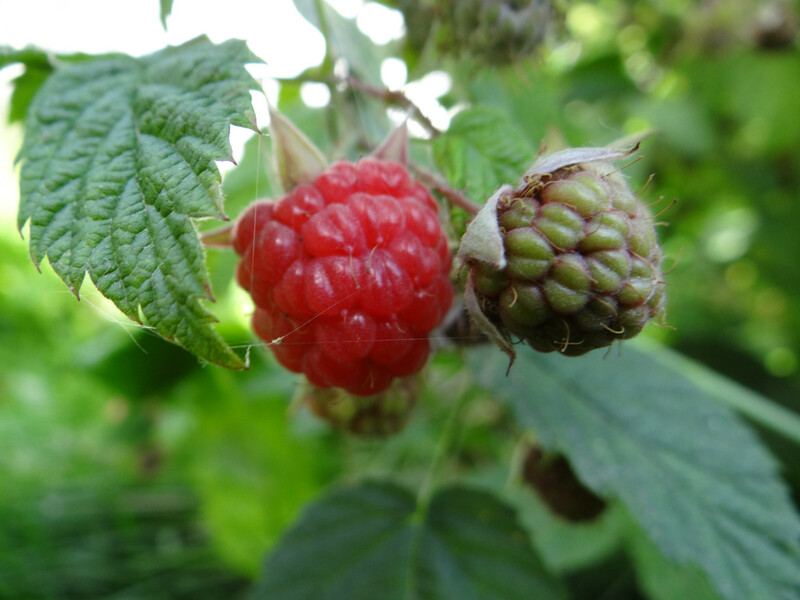 They were planted in a good, alkaline soil which is not the preferred soil for raspberries. The friend had them in the yard when she bought the house. I saw some areas in her backyard that might be better and I'm giving her some of my smaller canes to try planting. Plan your planting carefully. Because if you want the raspberries, they will want the entire part of your yard you are planting them in. So don't try putting a few canes by your prize irises. Raspberries can even outspread mint. They do have thorns, so if you have a patch as deep as mine, it helps to have two people to harvest. One to hold back the canes while the other gets in and grabs the berries. The best thing about growing your own raspberries is getting them at their absolute peak. They are easy enough for anyone to grow which makes them an awesome choice for kid's gardening. The ones that I planted as a kid grew and produced berries with my indifferent care. Well cared for, like my current thatch, they will give you lots of berries to make all sorts of wonderful treats.